You don't have to travel far to visit one of Southern California's most historic and unique towns. 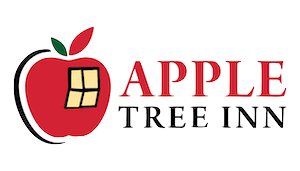 The Apple Tree Inn is located just an hour and a quarter from the San Diego Airport and 5 minutes from the historic town of Julian. Book a trip you'll never forget and discover this hidden gem. With famous restaurants and eateries like California Mountain Bakery, Jeremy's on the Hill, Wynola Pizza and Bistro, Julian Hard Cider, and Mom's Pie House all within walking distance, you'll never feel far from it all. The Julian Apple Tree Inn is not just a simple roadside motel. The property is in a great little town on beautiful grounds. The rooms are very large and fully remodeled with lots of niceties. Multiple room types to accommodate lots of guest needs including 2 suites, a 3-bedroom farmhouse, and an accessible room for our disabled guests. Get away to nature and explore our State & Federal Parks and Nature Preserves or go local with a more urban experience. There's no shortage of activities to choose from while staying in beautiful Wynola and Julian. The Inn is just 3 miles from main street in historic Julian but has lots of shops and activities right in Wynola. Experience solo exploration to family-friendly activities or a romantic getaway, Julian is the best place to be. From outdoor adventures to animal encounters to horse-back riding to relaxing winery getaways, we're conveniently located near a wide variety of attractions for both kids and adults. Our Deluxe remodeled Queen Room features one queen-sized bed with plush, soft sheets allowing you to have a super-comfortable night's sleep. It's easy to Relax and Enjoy with TV, WiFi, and a new AC/Heating unit for perfect temperature controls. Wake up and smell fresh coffee from your own Keurig machine. We have one Deluxe Queen Accessible room that complies with the ADA and features a roll in shower. Check the Accessibility Menu item for more details. Our fully remodeled Deluxe DOUBLE Queen Room features two queen beds, each with plush, soft sheets allowing up to 4 people to have a super-comfortable night's sleep. Our Deluxe remodeled Double Queen Room features TWO queen-sized beds with plus, soft sheets allowing you to have a super-comfortable night's sleep. It's easy to RELAX & ENJOY with TV, WiFi, and a new AC/Heating unit with perfect temperature control. Wake up and smell fresh coffee from our ever-popular Keurig machine. This fully remodeled 3-Bedroom 2-Bath Farmhouse is an exceptional opportunity for you and your family to get away for some real R&R. Two of the bedrooms each have a comfy Queen bed with our renowned plus linens and pillows. The third bedroom is a small secret room behind the kitchen. ... a very fun and cute room. The Farmhouse has a full kitchen with all the amenities, a luxurious Dining Room, and an oversized Living Room with comfortable couches and chairs. The Patios offer fantastic views to the many acres of the property. RELAX & ENJOY. This nice home-away-from-home includes TV and WiFi as well. This fully remodeled 1-Bedroom Suite on the ground floor has 2 Queen Beds, each with our very popular super-plus and comfy sheets and pillows. A full Kitchen and Living Room with Sofa-bed gives you and your family an opportunity to escape. RELAX & ENJOY the nice views and spend time on the deck right outside your door. TV, WiFi, and a new AC/Heating unit with perfect temperature control makes your stay super comfortable. Wake up and make yourself a nice fresh cup of coffee from our ever-popular Keurig machines. one-bedroom Upstairs Suite with plush, soft sheets and pillows. RELAX & ENJOY. Great views and remember to spend time on the deck right outside your door. TV, WiFi, and a new AC/Heating unit with perfect temperature control makes your stay super comfortable. Wake up and make yourself a nice fresh cup of coffee from our ever-popular Keurig. Our Mission: Serve our guests with dignity and pride and ensure that we do everything possible to make your stay comfortable, peaceful, and thoroughly enjoyable.